The new MGNV logo appears in the upper right hand corner of the fact sheets. Almost four years have passed since we announced that we were revising the Tried and True Native Plant Selections for the Mid-Atlantic fact sheets with easier-to-read format, new information, and new images of plants that can (mostly) be visited in local public gardens. We also identified those plants included in the Plant NoVA Natives campaign and last year added the new MGNV logo. You can compare the reformatted Quercus alba fact sheet pictured in the February 26, 2015 article to an updated version featured in the December 7, 2018 posting as examples. True, we exceeded the anticipated timeframe for completion. Research and reformatting took a bit longer because–you know–life happens. Not surprisingly, it consumed more time to identify good specimens in public gardens and to collect images of these plants during their different development stages. Despite these hurdles, as of the end of 2018, the original fact sheets have been updated to the new format and display new, MG-generated images! (Well truth be told, we kept one public domain image. Bill Buchanan photographed a hummingbird feeding on a cardinal flower at a wildlife refuge in the Mid-Atlantic Region–and we couldn’t do better than that!) As we did more research, we eliminated a few plants on our original list that turned out not to be the most reliable or available species in our area and added a few more favorites so that there are currently 99 plant fact sheets in our database. Videos now augment a few of the fact sheets showing how the plants attract pollinators or transition from season to season. 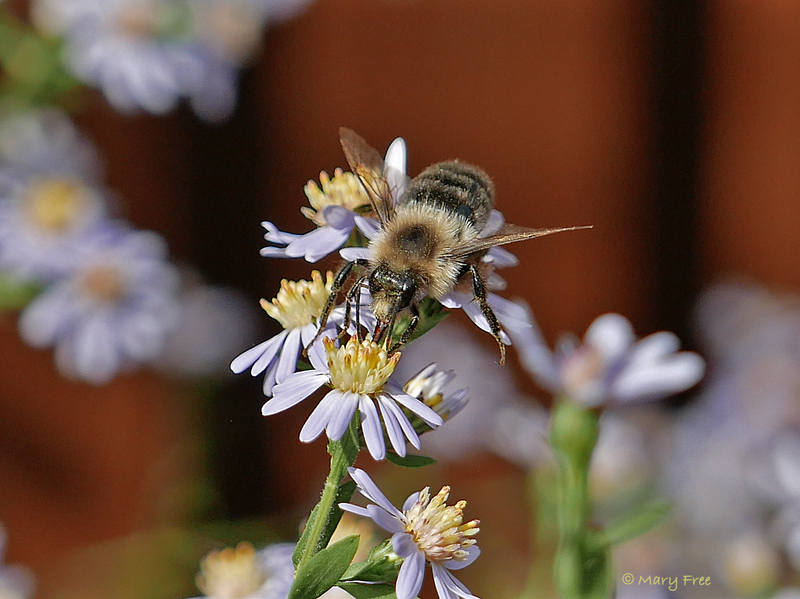 A fact sheet was added for Symphyotrichum cordifolium (blue wood aster), a proven, late-season pollinator magnet in the demonstration Quarry Shade Garden. A male common eastern bumble bee drinks nectar from the asters it inspired me to plant in my own garden. Thanks to all Master Gardeners who came up with the concept of the Tried and True native plant sheets and those who contributed images, and especially to Elaine Mills who worked on the content of the original sheets and has provided, labeled, and archived photos as needed. Over the years, she has not only routinely visited our local demonstration gardens but traveled to other gardens and parks in the Mid-Atlantic Region in order to find prime examples that illustrated a particular plant’s characteristics or use in the landscape. 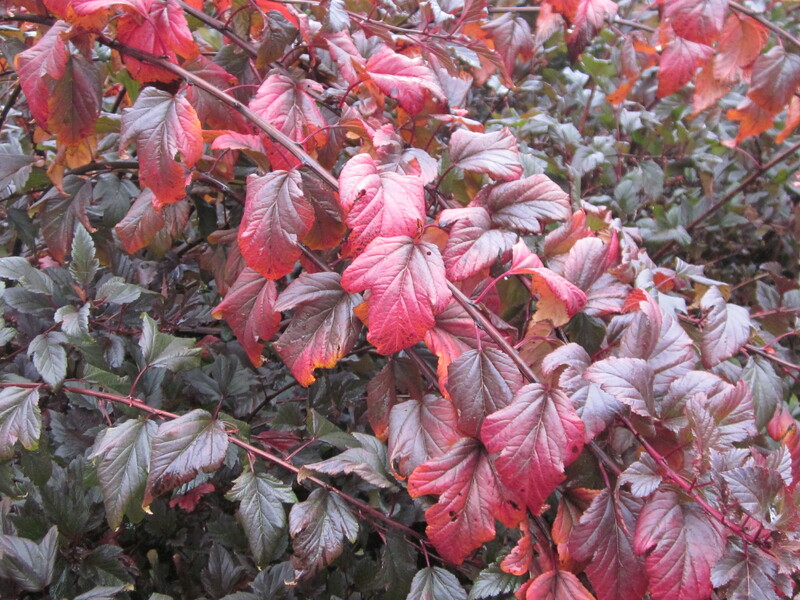 An October trip to Longwood Gardens in Pennsylvania found the Physocarpus opulifolius (ninebark) cultivar ’Summer Wine’ at peak color. Although the fact sheets focus on native species, sometimes cultivars with desirable characteristics, such as compact habit, disease resistance, and color, deserve a mention. Elaine has written reviews of several of these regional gardens accompanied by photographs that highlight their beauty and unique and varied offerings. Although they all deserve a visit, some of her favorite spots–Meadowlark Botanical Gardens, United States Botanic Gardens, and the United States National Arboretum–are not too far (less than 20 miles or so) from the Virginia Cooperative Extension (VCE) office at the Fairlington Community Center (FCC) in Arlington. Plantings at local community centers like the FCC and City/County parks and nature centers have also provided photographic opportunities. Elaine has even stopped at roadside sightings to capture images of exemplary specimens. 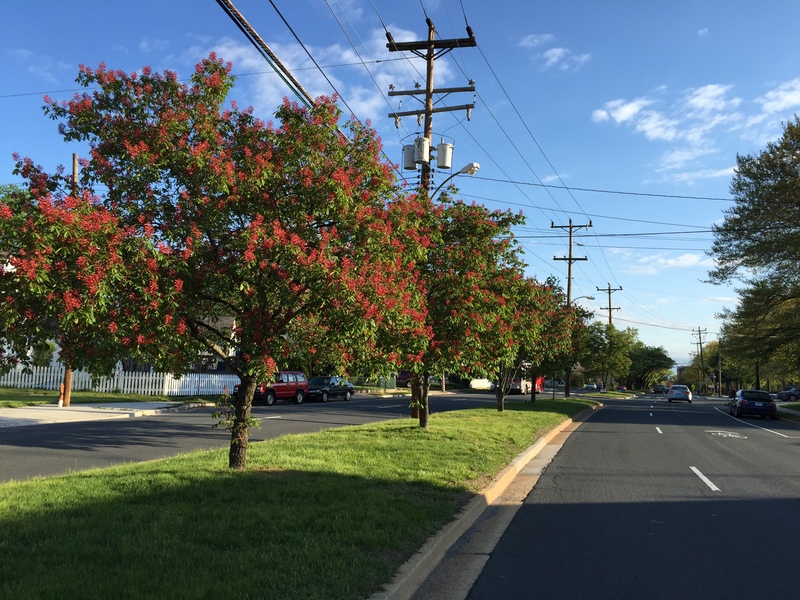 Flowering Aesculus pavia (red buckeye) spied on the Walter Reed Drive median strip in Arlington merited some pictures. 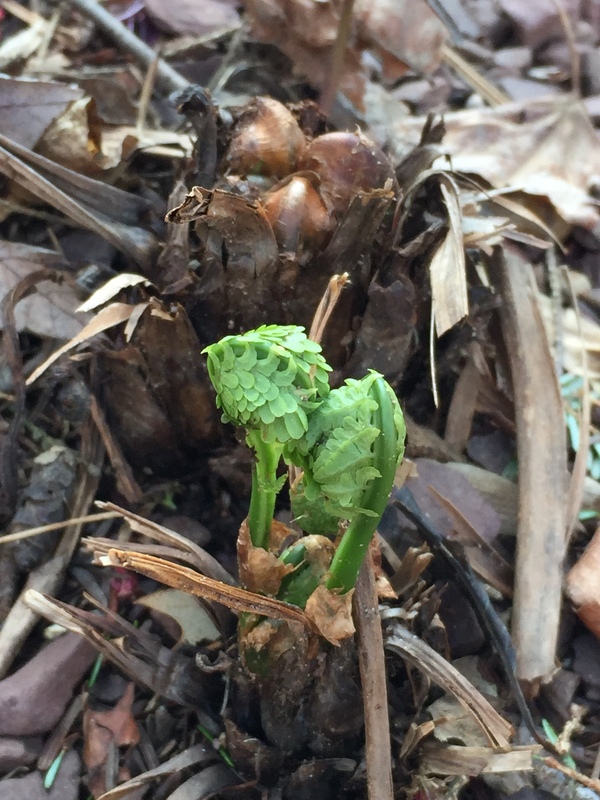 It took several years and just the right timing for Elaine to capture the emerging fiddleheads of Matteuccia struthiopteris (ostrich fern) at the U.S. National Arboretum. Did you know that in New England they are considered a delicacy? 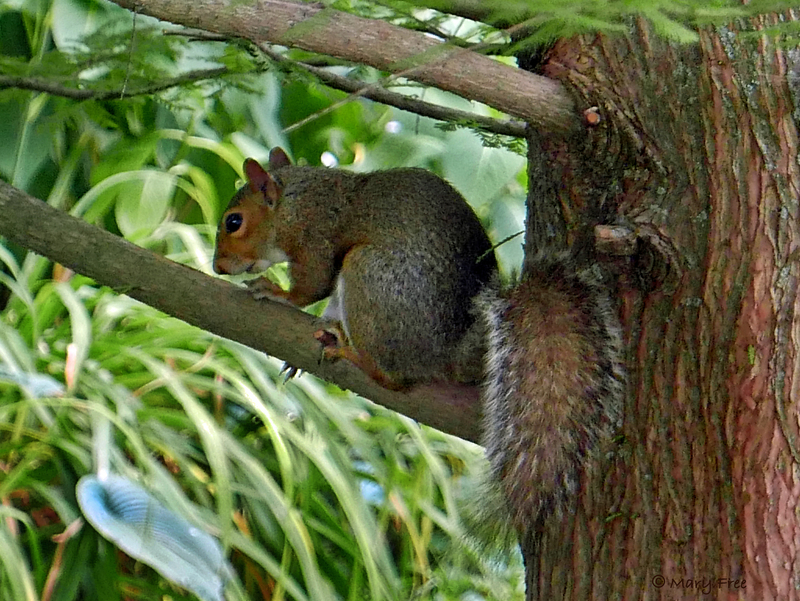 At Glencarlyn Library Community Garden, an eastern gray squirrel tried to escape the camera by scurrying up Taxodium distichum (bald cypress). Little did it know that I was as much interested in the red and brown fissured tree trunk by which it sheltered. Besides revising the fact sheets, I have concentrated on photographing wildlife interacting with plants. I did not travel as far or as often as Elaine but still spent much time with my cameras (as inconspicuously and as patiently as possible) hunched over, sitting by, or following the flight of individual creatures. Reviewing the results of these sessions always brought surprises and disappointments–delight at what the camera captured that was not so apparent to the naked eye and regret at what the camera did not fully capture, because with my fixation on one subject, I failed to see another and to move the viewfinder or adjust the focus just a tad. In many cases, more time was devoted to combing through field and online guides trying to identify a particular insect than in filming it. Besides the wildlife featured in the plant fact sheets and videos, you can Learn about Pollinators (located on the sidebar) in our online blogs and about Wildlife (located under Resources on the navigation bar). Last but not least, special thanks to Elena Rodriguez who manages the weekly Web postings and the technical aspects of archiving and organizing our many fact sheet iterations. In 2017, MGNV won first place at VCE Master Gardener College for its public education efforts through digital media. These included promoting each week different fact sheets, which continue to be the most viewed pages on mgnv.org. Elena was featured in VCE’s In Season magazine for her extraordinary work in converting MGNV documents and photos from a Yahoo Groups platform to Google Apps, which has greatly facilitated our work on improving the fact sheets. 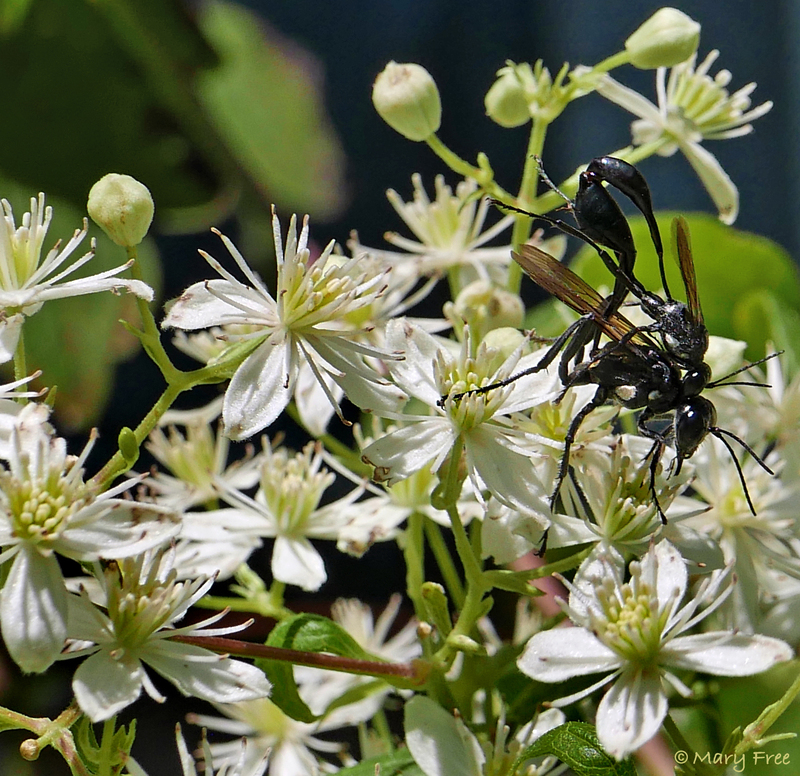 These mating thread-waisted wasps, Eremnophila aureonotata, will appear in a new fact sheet to be posted August 30, 2019 as well as in an accompanying video. What’s in store for the future? Well we won’t be resting on our laurels (especially since Laurus nobilis is not native here). We will continue to collect images and add them to the fact sheets where needed and create more videos of interest. And, for now, we plan to add a few new fact sheets to our database every year! For example, this year we will be adding…oops…don’t want to give away the surprises. So continue to view our posts every Friday and perhaps you will find a new native plant or more for your garden. The pollinators will thank you and you can enjoy all the buzz. If you have comments about any of the native plant fact sheets, please contact webmaster@mgnv.org. We hope that over the years, we have addressed the questions raised by those who have contacted us. Thank you for your continued interest and support. Happy New Year! This entry was posted in MG in the Garden, Tried and True Native Plant Selections for the Mid-Atlantic and tagged MGNV, Tried and True Native Plant Selections for the Mid-Atlantic. Bookmark the permalink.